We now offer 2 type of licenses Home/Academic and Commercial. Also, the price of the commercial license has been reduced. The reason for this is that we stripped active support from the license cost (we now offer support only in the advanced version). After 2 years on the road we had very few support requests and so it made sense to make licenses cheaper by removing the costs of support. We switched to Qt 5, so PySide is unfortunately no longer supported. On the other hand the SDK now allows to build complex UIs. In fact, we fixed lots of minor issues in the SDK. The reason for that is that in the last months we had to offer a lot of SDK support and so we had to postpone many new features. The upside is that our SDK has become much more robust. We also changed our licensing schema, which is no longer year-based, but version based. To compensate current customers for the lack of updates in the last months, we have renewed for free their license for the 2.x series. If you’re an active customer and you haven’t received your new license, please contact us! This is mainly a bug fix version. If you’re curious about the ctor conflict, I have written a small post explaining it. The 1.0 version represents for its round number and intrinsic meaning a milestone in the development road-map. So how does the actual development stage compare to the original road-map envisioned for 1.0? Talking about file formats, few important ones are still missing. For instance ELF support is yet to be added. The reason for this lies behind the original idea to add support first for Windows file types. That’s why there’s support for esoteric file types like LNK and not for ELF. This strategy has been abandoned already some time ago and as you can see in 0.9.6 we added support for Mach-O executables. 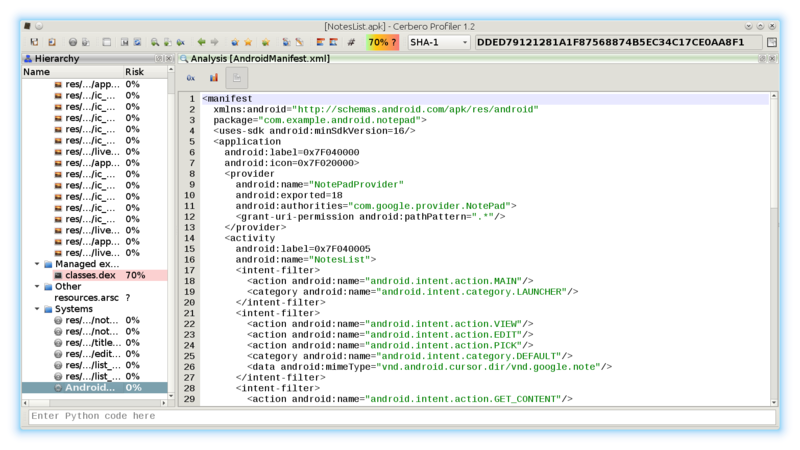 Also the overall support for Android (APKs, DEX, Binary XML) is very good and that only makes the support for ELF more important. Apart from that we’re happy with the number of formats currently supported and hope to significantly increase the number next year. Sorry for the sales pitch, I was saying… Yes, our product offer has increased. 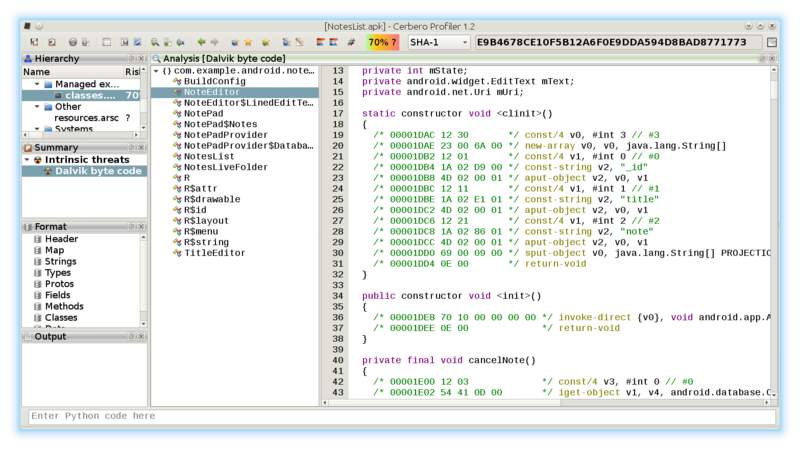 Few months ago we have released PE Insider, a free Portable Executable viewer for the community, based on the same code base as Profiler. 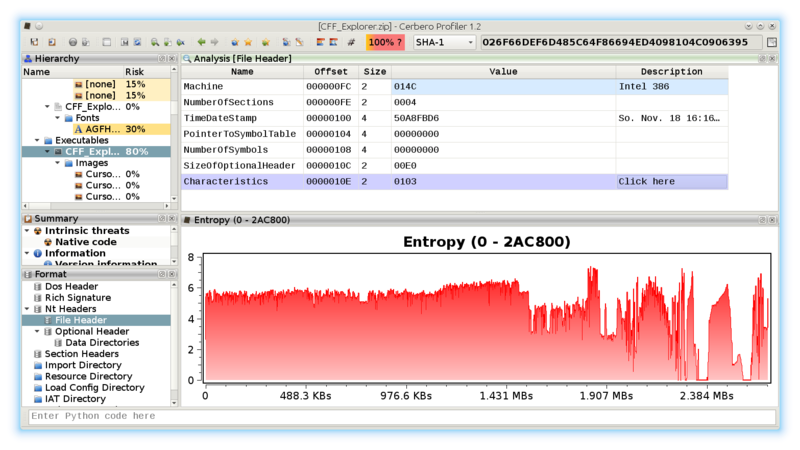 Also, we have recently announced an advanced (forensic oriented) edition of Profiler. While this does subtract some time from the standard version, it also drives development a lot and the standard version will greatly benefit from it. For instance, the newly introduced logic providers could’ve been added later were it not for the advanced version. And the benefits won’t come only as extensions to the core and internal components, but also as additional file support as we’re going to show soon. To mark the current milestone, starting from this version we’ll change the progression of versions. Every new release will increase the minor version (rather than the last number which will be reserved for bug fixes). We hope you will accompany us in our journey towards 2.0! Notice that not only is the union anonymous but even its substructures are. 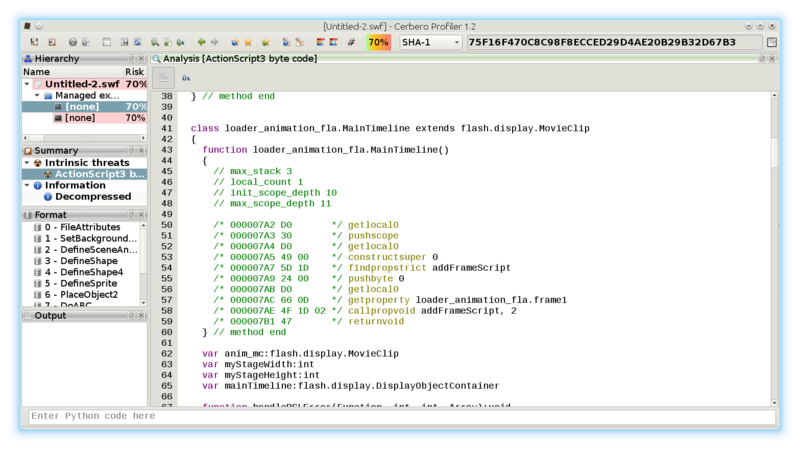 The Header Manager is now capable of correctly importing this code. As usual anonymous types will be renamed (both their type and name). Since some improvements are PE related, PE Insider has been updated as well. 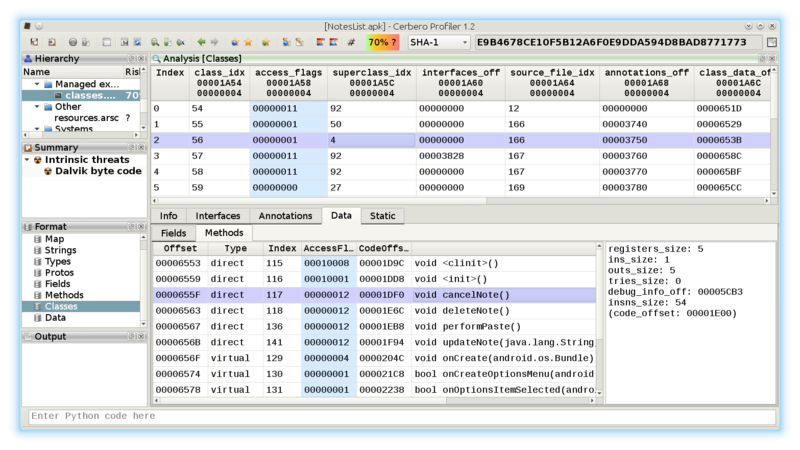 The new 0.9.6 version of the Profiler is out. 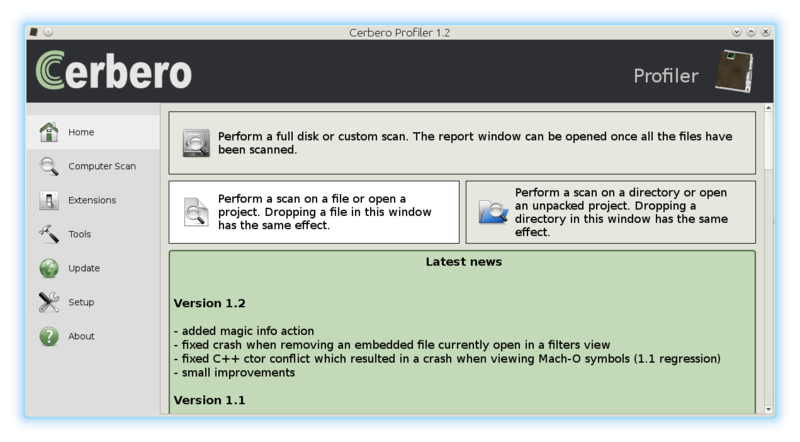 The main new feature is the support for Mach-O files. Since this feature stands on its own, it did make sense to postpone other features to the next version and in the meanwhile let our users benefit from this addition. While most of the items in the list have been discussed in previous posts, some of them need a brief introduction. 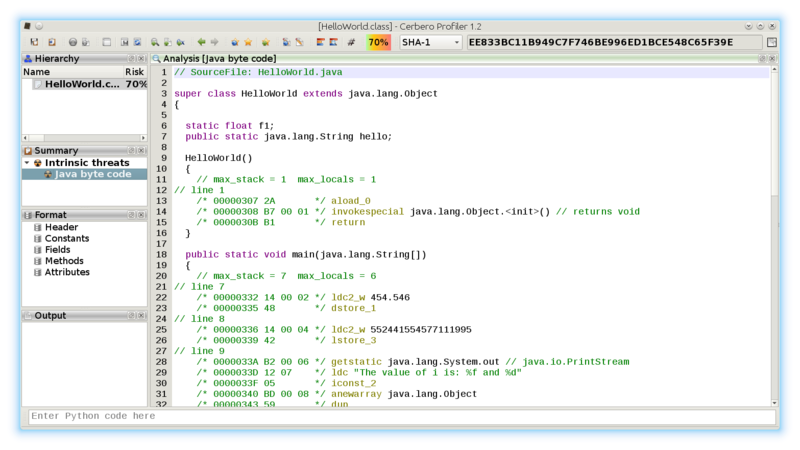 While shellcode detection applies by default to files of any size, you might want to specify a threshold. This is useful if you want to speed up the analysis of large files. It might come handy in some cases. Of course one could use a filter to hash the file, but the advantage of this method is that once a particular hash type has been computed it won’t be computed again if requested by another hook. 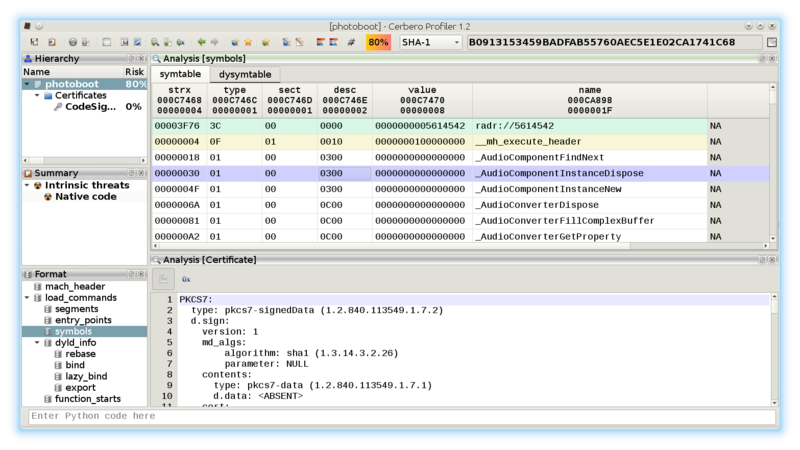 In one of the previous use cases we’ve analyzed a huge set of malicious RTF documents. Some of them were not recognized correctly and some of them showed problems in the automatic extraction of OLE streams. This release fixes these issues. As you can see all RTFs are now correctly parsed and their OLE stream has been extracted. Some of the OLE objects though are not extracted correctly. After looking into it, it seems to be a problem with the malicious files themselves. 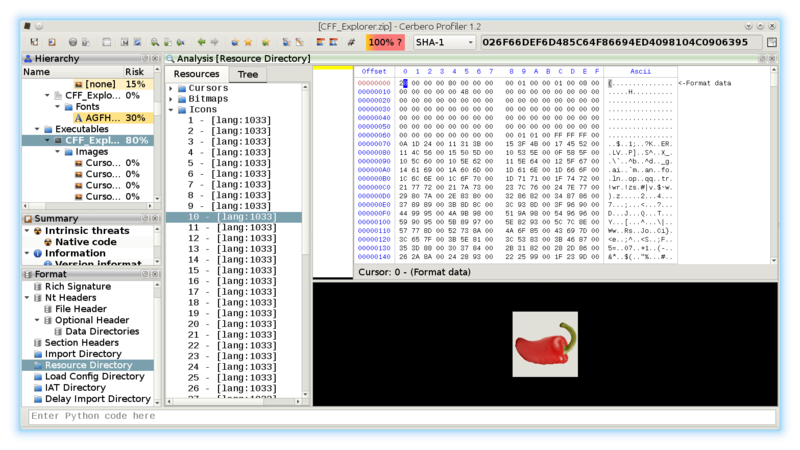 OLE streams are encoded as hex strings into the RTF and in some of these files there’s an extra byte which invalidates the sequence. That ‘A’ character between 00 and 4D makes the sequence to be 00 A4 D which is incorrect. Our guess is that the malware generator which produced these RTFs outputted some invalid ones by inserting an ‘A’ character instead of a 0x0A newline. While RTF readers are not able to parse these objects either it’s still interesting for our analysis to be able to inspect them. 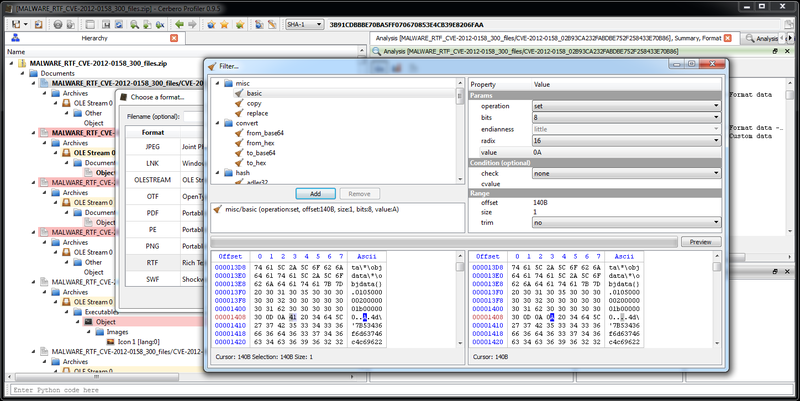 So we just load the RTF files patching the ‘A’ character with a filter as in the screenshot below. 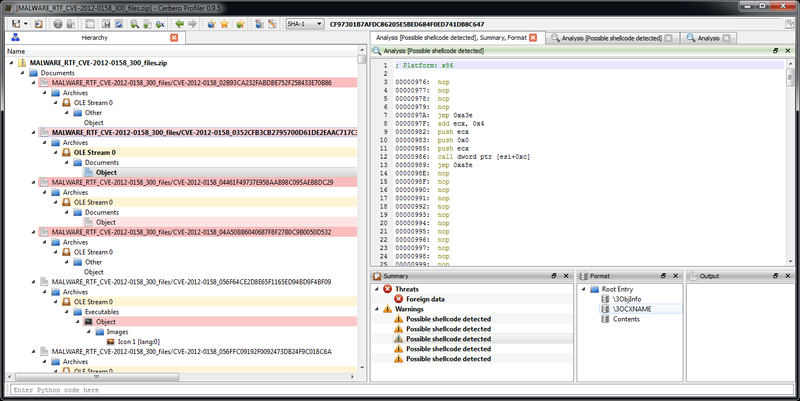 That fixes it and we are now able to inspect the embedded OLE object and its threats. 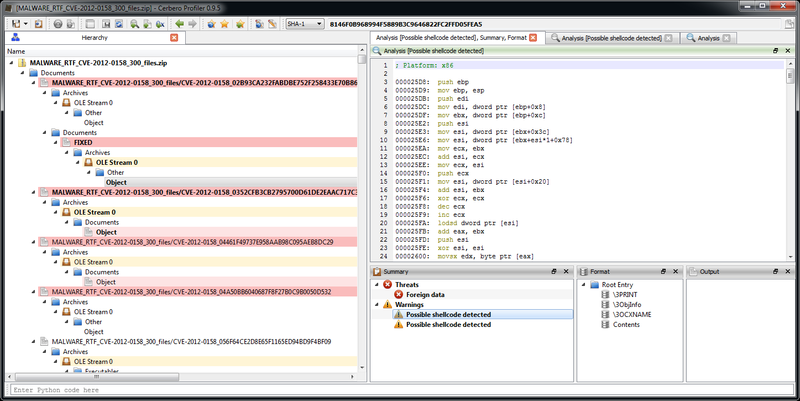 As you can see we get directly the shellcode disassembly from the automatic analysis.